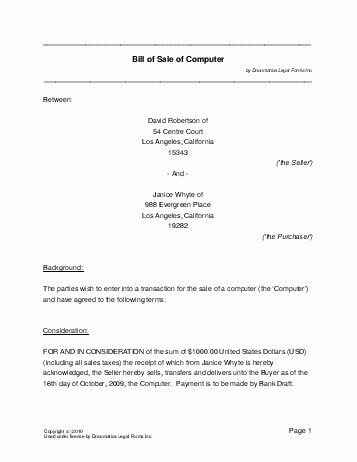 This document is similar to a bill of sale. It includes basic information such as the buyer, seller, payment amount, payment method, and currency. However, the computer bill of sale form allows the description of specific technical information and features relevant to the sale of computers or laptops. It also allows for the seller to offer a warranty if they wish. Are sales taxes included in the purchase price? Is there a floppy disk drive? Is an instruction manual included? Is there some time remaining on the manufacturer's warranty? Are there other features you want to describe? Is there any cosmetic damage that does NOT affect the function? How many areas of damage are there? Is there any physical damage that DOES affect the function? Do you know when the transaction will take place? To ensure the validity of this document, we recommend the presence of one or more witnesses and a notary public. Will the Buyer(s) be signing? We strongly recommend obtaining an attorney reviewed Computer Bill of Sale directly from us.